"We have put in place strategic plans and the necessary infrastructure to expand at a healthy, controlled rate due to our recent tremendous success," said Mat Ishbia, current president of USFS and UWM. "I look forward to assuming the role of CEO at United Shore Financial Services and continuing to grow the company's wholesale and retail residential lending channels." TROY, Mich., May 31, 2013 (SEND2PRESS NEWSWIRE) — United Shore Financial Services (USFS), one of the nation’s leading independent mortgage lenders, announced that Mat Ishbia will be appointed to the position of chief executive officer for the company. Ishbia currently serves as both president of USFS and also its successful wholesale operation, United Wholesale Mortgage (UWM), which under his leadership has now become the fourth largest wholesale mortgage lender in the country. Notable is that under Ishbia’s guidance, UWM has grown exponentially since he started-from only five percent of total company production to over ninety percent. Recently, Ishbia was named as one of the 40 Most Influential Mortgage Professionals Under 40 by National Mortgage Professional Magazine, and was also named a Crain’s Detroit Business 40 under 40. His vision to establish a unique business model that is intensely focused on next-level client service is, among other things, what has largely attributed to UWM’s success. “USFS is pleased to announce Mat as our new CEO; he has demonstrated his leadership by far surpassing industry benchmarks and setting unprecedented growth rates. His business acumen, proven leadership skills and sterling reputation are unrivaled,” said David Hall, president of USFS’ retail arm, Shore Mortgage. Kip Kirkpatrick, USFS’ present CEO, will make a planned transition from running the day-to-day operations of the business to holding a seat on the company’s advisory board. Earlier this year, USFS brought its more than 1,200 employees together under one roof at its new state-of-the-art corporate headquarters located at 1414 Maple Road in Troy, Michigan. The move consolidated all of USFS’ team members from four locations in Birmingham, MI and Troy, MI into a single location on three floors with more than 140,000 square feet of new space. Just two weeks ago, Michigan Governor Rick Snyder visited this new headquarters to spotlight USFS’s contributions to the community and its plans to hire 600 new employees in 2013. Headquartered in Troy, Michigan, USFS was founded 27 years ago and is one of the largest, fastest growing independent mortgage lenders in the United States. 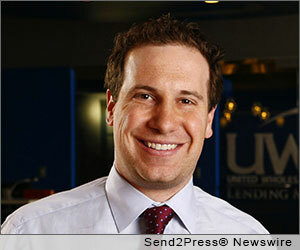 It operates three brands: United Wholesale Mortgage, Shore Mortgage and Capital Mortgage Funding. United Wholesale Mortgage is the fourth largest wholesale mortgage lender in the country, while Shore Mortgage is a nationally known, direct-to-consumer mortgage lender. Capital Mortgage Funding is a leading mortgage lender in southeastern Michigan. Together, the company employs more than 1,200 team members, projecting over $16 billion in originations and 600 additional employees in 2013. For more information, visit http://www.unitedshore.com/ . PHOTO CAPTION: Mat Ishbia, CEO of USFS. Original Keywords: wholesale mortgage lender, United Shore Financial Services USFS, united wholesale mortgage, shore mortgage, capital mortgage funding, jeff ishbia, mat ishbia, kip Kirkpatrick United Shore Financial Services Troy Michigan TROY, Mich.
REFERENCES: Banking News, wholesale mortgage lender, United Shore Financial Services USFS, united wholesale mortgage, shore mortgage, capital mortgage funding, jeff ishbia, mat ishbia, kip Kirkpatrick United Shore Financial Services Troy Michigan TROY, Mich.